Here’s a trailer – if you’d like to see the full film, you may be able to…it will be playing at the bookshop very soon! We now have a YouTube channel, where we’ll post any videos we make. It needs a bit of work, but it’s up and running! The wonderful Tim Jenkins has offered to make the Treehouse Confessions for us, a video with each of the musicians who come and play for us, chatting, making a confession and singing a song – the first one is up, and it features the amazing Hattie Briggs. This is lovely – thank you Tim, thank you Hattie! Also on there is a video of Ailsa Tully when she came to play for us – also fabulous! Her boyfriend Joe made the video of one of her songs and sent it to us. You can subscribe to the channel to receive updates when we add new ones – though I’ll always share them with you! 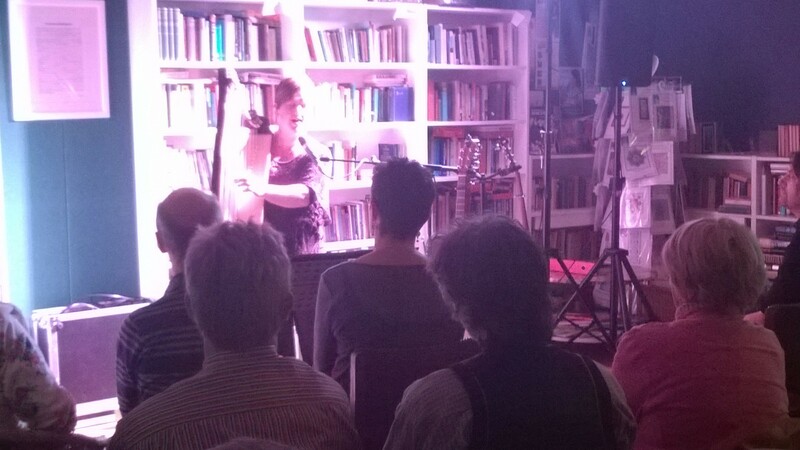 Many thanks to Roy Spencer for this review of the wonderful Ange Hardy gig last month, and of the Tree House itself! 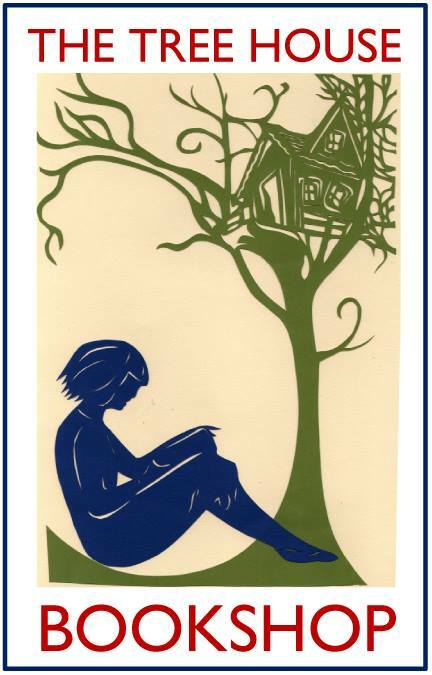 Kenilworth’s Tree House Bookshop is a lovely little gem of a place, a short walk from the town’s historic clock tower. The not-for-profit shop is run for the community by Victoria Mier and a small team of volunteers and stocks a wide range of donated books at low prices. As well as its comfortable seating and nominally-priced hot drinks and cakes, the shop is a true community space, offering a growing range of out-of-hours activities from art history talks to craft fairs, classic film shows to silent reading sessions. Among the popular events are regular music sessions, for which Victoria books well-known touring folk and acoustic acts and encourages up-and-coming local performers with open mic evenings. A pleasant mid-September evening saw the welcome return of Ange Hardy, who was performing a handful of dates in the area before embarking on her Coleridge Way tour, near to her West Country home. Just six days short of a year earlier, during September 2014, Ange had visited the shop in its previous premises and while browsing the shelves chanced upon a copy of Coleridge’s Poetry and Prose. That book was the spark that ignited the inspiration behind recently released new album, Esteecee. Ange started her set with the first public performance of The Daughters of Watchet, a song that she had completed only a day earlier while travelling to the gig. While she sang the haunting song unaccompanied, Ange’s skilful use of an impressive array of looping pedals turned it into an enchanting exercise in three-part harmony. The first of only two contemporary covers followed: a delicate guitar-led version of The Queen and the Soldier, which was first heard on Suzanne Vega’s self-titled debut. Delving into her back catalogue, Ange filled the room with the beautiful vocals of Mother Willow Tree from the 2013 album Bare Foot Folk and a few from last year’s The Lament of the Black Sheep. The Lost Soul became particularly poignant after she described her time spent as a teenager living on the streets of Dublin, while witty tribute to absentminded daydreaming The Woolgatherer even had the hesitant audience singing along. An elderly gentleman’s sad story of hope had inspired The Sailor’s Farewell, during which Ange’s cleverly looped voice did a nice job of reproducing the sound of the released recording. More multi-tracked harmonies introduced The Foster Mother’s Tale, the opening song from Esteesee, before the gentle Pantisocracy described Coleridge’s interest and failed involvement in an ideology of equality for all men. Ange’s fascinating use of layered whistle and harp along with her voice made traditional eighteenth century song The Trees they do Grow High just about as compelling as it could be and was rightly lapped up by the enthusiastic crowd. The music continued with another visit to Esteesee, taking in Friends of Three, the album’s title track with its softly plucked harp and a little later, Along the Coleridge Way with an intricate combination of live and looped harp. A pair of sombre songs about separated love, the traditional The Waters of Tyne, perhaps best known in versions by Tynesiders Jimmy Nail and Sting, was coupled with Kate Rusby’s Let the Cold Wind Blow, so it was only fair that Ange chose to lighten the mood somewhat by ending with a rather light-hearted song about a dog. An engaging orator as well as a talented singer and skilled musician, Ange Hardy kept the audience enthralled with interesting dialogue, sharing background information and revealing snippets of her personal history. Her remarkably clear singing voice, precise use of multiple loops and a varied programme of original, traditional and modern songs made a memorable evening of superbly performed and absorbing music.